A stylish pool and surrounding gardens are the focal point here for fun days in the sun trying everything from mini-golf to windsurfing. The Shalimar has an international feel and lies just 150m from its own section of beach, while the resort centre is 2km away so you're handily placed for all the usual holiday activities. Rooms are located in the main hotel building and in bungalows within the hotel grounds. 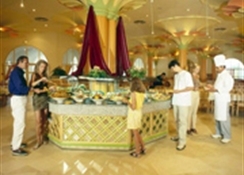 The hotel has 4 Restaurants: Main Buffet Restaurant Palmier (400 sets) with Terrace. Themed Rest. I Oriental. Themed, the Sea Food & Fish (Sea Food) and the Beach Barbecue Rest Flouka.The hotel offers a Wellness centre « Elyssa Spa » : Indoor pool, fitness, sauna, massages, Hammam, Beauty & Hairdressing salon. Various Cures and Treatments, 2 tennis courts. Mini golf, bowls, Archery, water polo, aerobics, billiard, Beach Volley and Multi purpose court (for handball, mini-foot and basket ball). The Shalimar hotel is located 80 km away from the Monastir Airport, 60 km away from the Tunis Carthage International Airport, and 6 km away from the Medina of Hammamet & 4 km away from the marina of "Yasmine Hammamet". There are 2 Golf Courses " the Citrus" and " Yasmine Golf"" both at 5 km distance. The hotel features 208 rooms, including 04 suites, 13 junior suites and 54 bungalows (560 beds) on 2 floors. All the room are equipped by a bathroom, balcony or terrace, telephone & satellite TV, tiles, safe at the reception, Mini - Fridge (Paying ? On Request), 2 elevators, a large, luxury lobby. No smoking rooms, laundry, satellite TV channels. The nearest airport of the hotel is the Tunis Carthage International Airport approximate 45 mintes driving time and distance about 60km. All means of transport are available outside the airport to transfers customers. 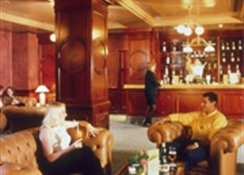 The hotel is 300m from the nearest bus stop, the city center and shops are 15 minutes away about 6 km.